Alongside our Saturday Songwriting School, we can bespoke workshops for Young People within their own environment. 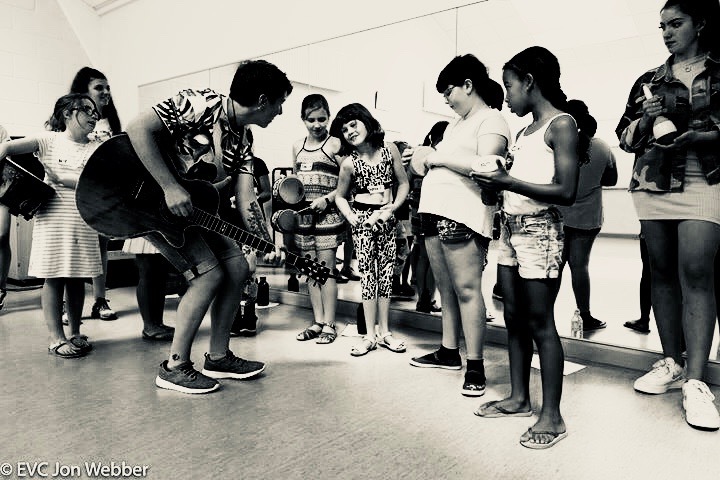 As well as helping student development through enabling emotional stability and offering therapeutic benefits, songwriting channels self-expression, self-discovery and can help to overcome challenges. We can work within your School, College or Youth Group to help your young people build on their creative skills and open them up to new ways of thinking. Workshops are designed and run by our experienced staff from across the Southend borough. We’re a collective of musicians who are published artists, touring musicians and experienced teachers, all from within the local area. There is a thriving music scene in Southend and across south Essex. Working with us provides students who are serious about a career in music, a ready made group of experienced peers to look to. We believe a group of like-minded peers is essential for young people to thrive. For a one-off workshop, the day begins with introductions and a jam session. This allows everyone to work together and gives our facilitators an insight into ability, confidence and development opportunities of individual students. We will then focus on language and creative writing, looking at various techniques to help students begin to write lyrics; alongside song structure and writing a melody: we look at these elements all together as songwriters tend to vary where they start in the process so it’s important to give students this insight early on and provide them with a number of tools to help them gravitate naturally towards their preferred starting point. Students can also decide to attend our Saturday Songwriting School. New intake happens half termly. This approach also caters for different levels - experienced students may pick up some methods they’d not considered from this session. This part of the day will take up a large majority of the time as we give students an opportunity to work through some of their creative process. This session will consist of a number of practical exercises, allowing us to work 1:1 with each student for a short period, helping the alleviate any personal barriers. The final hour will be spent feeding back as a group on what they have learned, perhaps performing anything they’ve written, though this is never forced. The above is based on a full day workshop (4 hours) with 4 facilitators to support. Thank you for your enquiry! We’ll be in touch very soon.